Carlos Carrasco has been one of the nice surprises of this 2011 season for the Indians as they appear to be building an excellent, young pitching staff. I was pissed about the Cliff Lee trade several years ago as the Indians gave up on Lee a year early in a pathetic salary dump. I usually applaud the Tribe brass for their trades, as they know how to find young talent, but they gave up Lee too early and they should have insisted on more in return. That said, they certainly got talent back with Carrasco. He’s been dominant at times this year, though he also goes through growing pains at times. This account from the KC papers from last night’s game is interesting. The Royals clubbed four homers Friday night, including three in the first four innings, in a 12-0 bludgeoning of Cleveland, but it was the response to those homers by Indians starter Carlos Carrasco that lit the fuse. Carrasco followed a grand slam by Melky Cabrera, which pushed the Royals’ lead to 7-0 in the fourth, by throwing a pitch at Billy Butler’s head. That prompted an immediate ejection for Carrasco that likely prevented an on-field brawl. The Royals were already coming out of the dugout and the bullpen when home-plate umpire Scott Barry threw Carrasco out of the game. 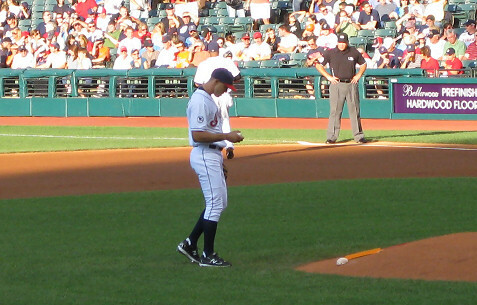 Carrasco insisted he didn’t go head-hunting. It was hard to find anybody in either clubhouse who bought Carrasco’s version. The near bean ball came in apparent retaliation for Cabrera’s elongated admiration of his slam before circling the bases. Even the Royals acknowledged that hitting the next hitter, Butler, was within the game’s unwritten rules. Just not in the head. Cleveland reliever Chad Durbin, who replaced Carrasco, buzzed Cabrera in his next at-bat with the bases loaded and two outs in the fifth. That brought no reaction from the Royals or the umpires. Hopefully this will be a good lesson for him.